Keeping my nails looking even half decent has been a mission of mine for a while now. For some reason I have absolutely cr*p nails and they are always splitting and breaking on me. Definitely not ideal when you’re a beauty blogger and a huge nail polish fan! My nails just haven’t been easy to look after and so for a while I just completely gave up on pampering them – I know, I know, completely the wrong approach Beky! Well, don’t you worry your pretty little heads because Sparkle PR have sorted me out and my nails have never been better! The first wonderful tool to get my nails finally looking tip-top has been the Bruzz Nail Brush* (available in Boots for £9.99) – This nifty little thing is literally the mother of all nail brushes. With three sides of super soft antibacterial bristles this nail brush is like no other, effortlessly cleaning the top, tip and underside of your nails all in one go, minimising mess and spray. I’ve always struggled with cleaning my nails before and with regularly attending bootcamp classes where dirt is easily captured under my nails (whilst doing the dreaded burpees – thanks Jodie!) I’ve never quite found the right brush to make cleaning my nails a priority. Dirty, I know – sorry! I’ve found that regular nail brushes are all too harsh and just end up breaking my nails more or just hurting my nail beds too much. The Bruzz Nail Brush is literally the softest thing going and as sad as it sounds I actually look forward to giving my hands a good ol’ scrubbing after a muddy bootcamp sesh! I also really love the fact that you can remove the inside of the brush (the bristley bits) and easily clean and dry it when its gets too mucky – so easy to ensure that all of your soap is removed and that the brush is squeaky clean for your next use! 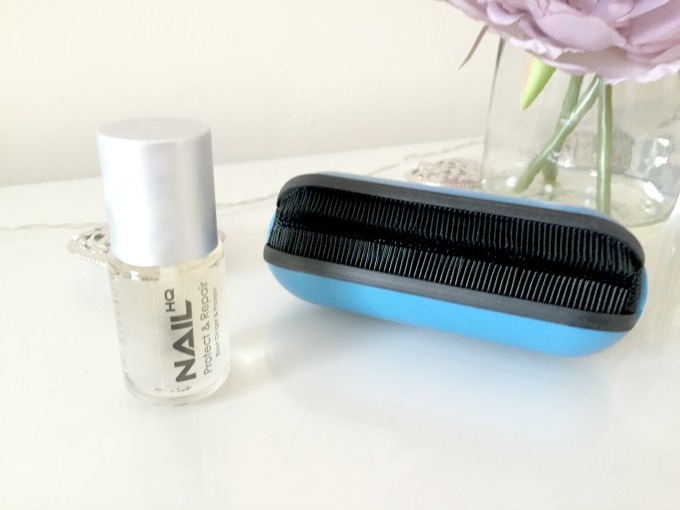 10/10 in my books – I never knew a nail brush could be so bloody amazing! The next product that has helped my nails in a million ways more than one is the sweet little pot of clear polish photographed next to the Bruzz above. Nail HQ are a brand I’ve featured on BekyLou before and absolutely loved and this bottle of Protect and Repair polish* (£7.99 in SuperDrug) has definitely not tarnished that reputation. This nail polish has strengthened them and stopped my nails from splitting full stop. I have literally been amazed by the power of this little liquid, I mean I loved the All in One polish that I tried from Nail HQ before, but this is like love on a whole new level. Never before has a polish stopped my nails from splitting so quickly. I’m not even exaggerating when I say how much of an absolute state my nails were in before, but they were a scabby mess. Within about a week or so’s use of this polish daily (taking it off and giving them a good file every night too) my nails showed such a huge improvement in their appearance. I’d been taking some Collagen Supplements at the time too, so I’m not sure if those had much to do with the health of my nails ‘from within’ or anything, but I definitely think that this polish had a big part in resuscitating my now healthy talons! I can’t wait to apply this for a couple more weeks (just to make sure they’re at their tip-topiest) and to finally start painting my nails pretty again! What are your nail care treatments and favourite nail care tools? Do you have issues with your nails like mine? Let me know in the comments, I’d love some tips on keeping mine healthy! Your blog is amazing I love it so much.